My team made it to the Elite 8 in basketball! That’s right – the Fighting Irish Men’s Basketball team moved forward to the Elite 8. (Hopefully our women will move forward tonight too!). 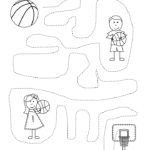 To celebrate, I decided to make some reading readiness worksheets with a basketball theme! I of course had to make a color by sight word worksheet for the Irish too. That way I can have lots of little readers out there cheering for the Irish! 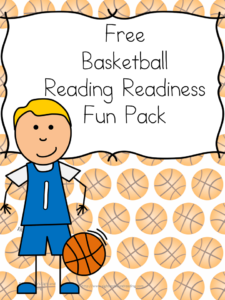 There are five reading readiness worksheets in all. Two are color by sight word with words using the first 10 days of our learn to read free program. 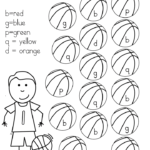 One is a confusing letter worksheet where the little reader needs to color the basketball a certain color for the different confusing letters (p,b,d,q,) There is one tracing worksheet and one cutting skills worksheet as well. 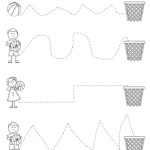 To get your free reading readiness worksheets, please enter in your information in the form below. You will be added to our mailing list where you will find out about more fun things like free worksheets! If you have any trouble downloading, please email me at [email protected] I am happy to help. Reading Readiness: When is my child ready to read? 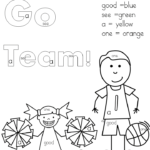 Preschoolers at about four years old are doing the sports theme activities this week. Please advice me on what games to introduce to them. hank you. Yvonne at NWCDC in Walnut Creek. These are perfect for our little guy to use at games as we watch his older siblings play basketball! You are so welcome…have fun! You are so welcome! Have fun!